A consistently productive surf fly that swims upside down Clouser-style. It works well on a variety of species including halibut, corbina, yellow finned croaker, and especially barred surf perch. 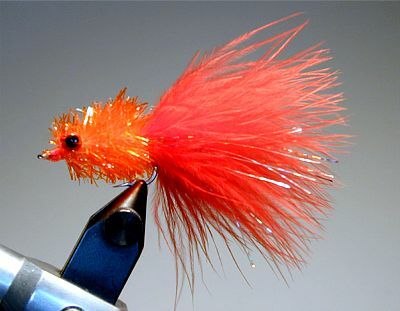 The weighted eyes help get this fly down in the surf and the pulsating marabou, bright colors, and holographic tinsel make this pattern highly visible in the surf. Tie Lead Eyes on top of the hook shank one third of the way back from the eye of the hook. Glue with Zap a Gap. Tie in a large clump of fl. red marabou approx. 1 ½ inches long to rear of hook shank at the bend. Then tie in 5 strands of Holographic Tinsel 1 ½ inches long, along the marabou on both sides. Tie in the Cactus Chenille at rear of shank and wind forward to the eye of the hook and tie off. Cast the Surf Rat over incoming waves and strip fast back through the surf zone. When wet this fly looks like a drowned rat.